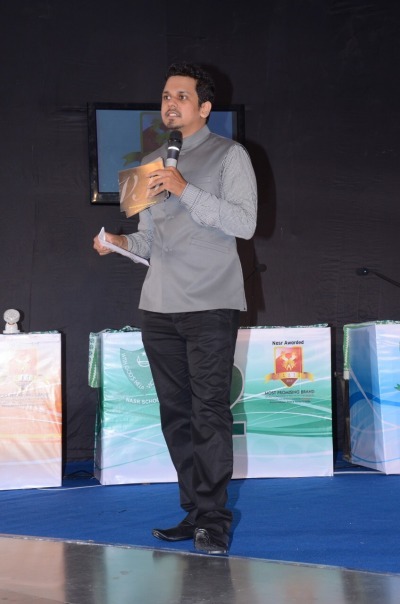 A National Level Quizmaster, The Mind at Mindcogs- India’s most engaging Quiz venture. With loads of experience in the field of quizzing, he believes in ‘Spreading Knowledge in an Engaging Way’. He is founder of Quiz company in India, Mindcogs. Vinay Mudaliar, is a Quizmaster of well repute in India, and has conducted various National Level Quizzes. He is also a Television Quiz show host. Vinay Mudaliar is associated with the CBSE Board, ICSE Board in imparting knowledge through Quizzes across the country. Vinay Mudaliar has the distinction of being the only Quizmaster in India associated with numerous world renowned educational publishers in spreading knowledge through Quizzing. He has conducted Quizzes in 55+ cities in India! Quizmaster in Bangalore, Chennai, Hyderabad, Delhi, Mumbai, Pune, Kochi, Nagpur, Bhubaneshwar, Hubli, Mangalore, Mysore, Delhi- NCR Region, Jaipur, Coimbatore, Vijaywada, Vishakapatanam, Chandigarh, cities in Uttar Pradesh like Lucknow, Gorakhpur, Kanpur, Varanasi, Rampur, Moradabad, Kolkata, Rourkela, Jamshedpur, Rajkot, Ahmedabad, Siliguri, Meerut, Ghaziabad among other cities. Quizmaster in India, Vinay Mudaliar is known for his high energy, wit , high quality content and his connect with students. His Quizzes are always eagerly awaited for participation by Principals and students from various schools. With over 750+ Quizzes, spread across 55+ cities in India, and reaching more than 30,000 students, he is currently one of the leading Quizmasters in India in the education industry. A crowd favourite Quizmaster in India, his distinct style of connecting to the audience through his Questions is a huge hallmark of his Quizzes. He has been awarded various awards and recognition for spreading knowledge among children across the country. What brings us immense happiness at Mindcogs is that we believe we can bring some change in a student’s life and in overall education and knowledge development in children. He is currently one of the best Quizmasters in India and is known for his engaging style and impacting children.